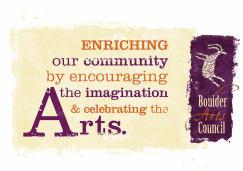 The Boulder Community Gallery, located in the Boulder Community Center, is sponsored by the Boulder Arts Council. It is a space to showcase a variety of visual arts for Boulder Town. Exhibits are either donated by local artists, traveling exhibits, or organized by locals with the support of the Boulder Arts Council. Exhibits are on display for approximately one or two months, have an opening reception, and open to the public during library hours (Wednesdays 11:00 - 1:00 and Saturdays 10:00 - 2:00) and when the community center is open.